Paul in the verses preceding the quoted verse proclaims believers united with Christ are led by the Holy Spirit and are sons and daughters of God. God’s adopted children are rescued from the fallen family of Adam, raised to a new standing in the divine family of the Father and counted as younger siblings of Jesus, the first born among many. But this divine adoption is not a ticket to trouble free life of ease. We recognize a connection between Christian suffering and Christ’s love. In Paul’s view suffering is God’s way of sculpting us into the image of His son. It is a sign of an unbreakable bond of love that unites believers to Christ. Like the crucified Christ, we living under the cross, who in suffering think we are defeated, are actually experiencing our greatest triumph. Nothing separates us from the love of Christ. 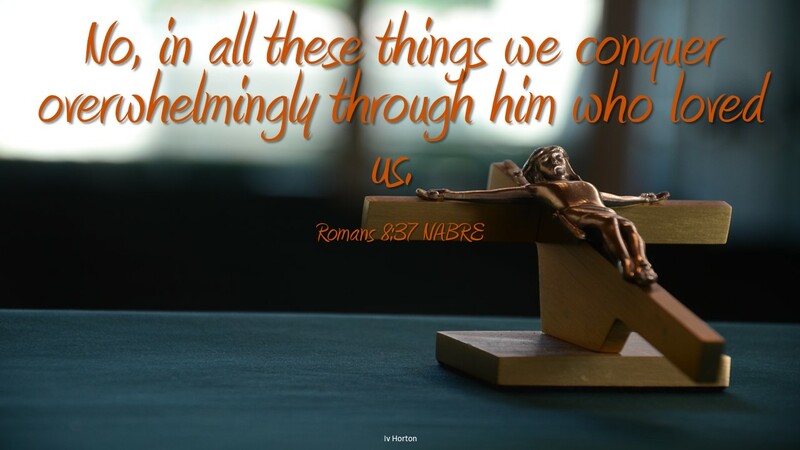 When we read “in all these things,” it is referring to our suffering, which we read is overwhelming conquered. It is the very things that we suffer which makes us sharers in Christ victory over sin. All taking place “through him who loved us,” through Christ we are victorious. There is nothing we can do on our own, we rely on Christ for the defeat of sin. It is through grace we are united and no outside agency or power could sever the bond that joins us to the risen Lord. We think God is remote and inattentive when we suffer, we wonder why we must endure. Like Christ’s cross our suffering helps defeat evil and molds us in such a way that we are more like Christ. We grow in these moments when we must rely on Christ to endure. Suffering is not from God, but God having suffered, uses our suffering to help us grow. Do you see grace in your suffering? Do you question the purpose of the crosses in your life?